Dominik Antonowicz, Marek Kwiek and Don F. Westerheijden) published a chapter “The Government Response to the Private Sector Expansion in Poland” in H. de Boer, J. File, J. Huisman, M. Seeber, M. Vukasovic and D.F. Westerheijden (eds. 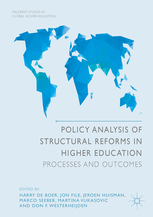 ), Policy Analysis of Structural Reforms in Higher Education. Processes and Outcomes. Cham: Palgrave. 2017. 119-140. One of the trademarks of transformation of Polish higher education is its tumultuous and inconsistent path of development driven by the rapid growth of private sector higher education. Such an expansion has been often described as a ‘sudden, shocking and unplanned’ phenomenon which revolutionised the institutional landscape of higher education in Central and Eastern Europe (Levy, 2007, p. 280). Also in Poland the rise of private higher education is perhaps one of those aspects of the Polish higher education that caused revolutionary and far-reaching changes whose significance can be hardly overestimated. It also attracts scholars’ attention (e.g. Duczmal and Jongbloed 2007; Antonowicz 2015a; Duczmal 2006; Kwiek 2012). But clearly, there is still a knowledge gap in regards to the analysis of coping with the expansion and with governmental efforts to take control over the process of galloping expansion and securing minimum quality standards in (especially private) higher education. The government desperately needed to gain control over the galloping expansion of higher education which serious undermined the quality of education. Internal and external privatization (Kwiek 2009) of higher education required a different role of state, to lesser extent as provider and more as a market regulator, to secure minimum levels of quality of education. It needed power to stop those who fail to maintain bottom-line standards in education from awarding academic degrees. At the time, the legal control and supervision mechanisms at the state’s disposal were weak (the relevant formulations in the act and in lower-level regulations were general and often ambiguous), the ministry was not staffed enough (6 people in the Ministry, including 3 part-timers, dealing with the private sector in 1999-2000), and, technically speaking, its physical access to, and its power to impose decisions on, private higher education institutions very were limited. So was the power of the existing representative body of the academic community, RGSW (The Main Council for Higher Education), created still under communism in 1985. The Main Council was unable – technically, legally, and in terms of infrastructure, staff and resources – to provide support to the Ministry in controlling and supervising the private sector. No other institutions were legally able to assess the quality of education offered in the sector (or any other dimension of its functioning). The ministry intended to address the problem of quality of education in the private sector. However, for legal reasons it could not confine itself only to private higher education institutions, while public universities were highly sensitive about any form of interference in their internal matters. To cut a long story short, it was legally impossible to focus only on the private sector but politically impossible to impose control on public universities, bearing in mind their high level of institutional autonomy granted in the law of higher education in 1990. The first attempt to regulate the private sector was conducted in the mid-1990s. The ministry produced a special law for the new category of vocational higher education institutions, trying to curb galloping expansion and also lay the legal foundation for public vocational higher education institutions. The legislation was approved by the parliament (1997), but a vast majority of private higher education institutions managed to escape from its jurisdiction (and vocational status) by opening master programs, which formally gave them academic status and institutional autonomy (Kowalska 2013).